Alaska like Hawaii is an adopted offspring of the American Union, the colossal continental conglomerate of the United States. As it happens with adopted sons and daughters who conform to the codes and behavior of the adopted family while maintaining a sense of individualism and an unmistakable personality that betrays their roots to their birth parents, Alaska is unique both in its ruggedness as a geographical casualty and in its embrace for the joys of life typified by the intensity with which its inhabitants approach the excitement of living every day with a fierce determination. The first thing one notices when arriving at the Anchorage airport after midnight, is that the place is jumping. Every restaurant, coffee stand, gift and bookstore is open and doing brisk business. Hundreds of people are bustling about. If you’ve ever traveled to any other major American city and arrived at 9:00 PM or later, you can’t buy a newspaper or get a burger. Everything is usually shut up tight for the night. It’s winter when we arrive. Our host called us before our departure inquiring as to whether we owned winter coats, perhaps not knowing that there is an actual winter season in Northern California. Just stand on top of Nob Hill in San Francisco on a rainy, foggy, windy night. Maybe it doesn’t snow, but it is bone chilling. The folks in the airport look appropriately outdoorsy. Lots of parkas, hiking boots, etc. Lots of energy for this time of night. We find out later that night flights are the norm. It all fits since the nights in Alaska are legendary. As we finally make our way out of the airport into the famous Alaskan night we are immediately exhilarated by the very fresh and cold, dry air. It’s not unpleasant. Besides this is 1999, the era of the remote controlled car. Everyone has those little clickers, and they put them to good use by pre-starting a locked car, so that it is toasty warm by the time you get into it. So in essence we are continually ushered from a toasty building to a toasty car and vice versa. The dance studios in Alaska are better heated than the ones in the Bay Area. A snow boot is necessary for walking even the short distance from dwelling to car, to avoid a misstep and a slip. Other than that our bulky coats, hats, gloves, sweaters, wool trousers, etc. seem like too much clothing. We meant to buy thermal underwear before we left, but ran out of time for this errand. It turns out to be lucky, since one more layer would surely be suffocating. The city landscape is luminous. There is deep snow everywhere. The kind of fairy tale magical snow that you only see in ski resorts or on calendar art or Christmas cards. It lights up everything. We’re told that the mayor has asked that the citizens of Anchorage use those little white Christmas lights for the entire winter season, leaving them on day and night, to help ease the psychological downside of the long winter nights. The huge evergreen trees look like they have been decorated by a whimsical pastry chef using gobs of white cake icing. Great swags of snow weigh down majestic boughs. Each and every branch of the other types of deciduous trees is completely and evenly painted with ice and snow. Many of the trees are festooned with the white lights the mayor requested. We are enchanted. 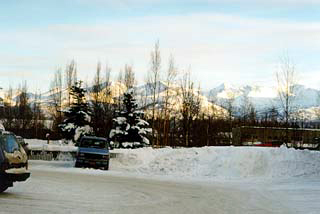 We are driven to downtown Anchorage to the home of a tanguera that has generously offered to house us. We keep looking for the prerequisite city skyline, typical of both large and small American cities. All we see are low buildings, with an occasional taller structure, maybe twenty floors at most. Our host points out a park that is the center of activity for summer soccer, concerts, softball and picnics. In essence the Anchorage version of New York City’s Central Park. It’s called Delaney Park and runs for four of five blocks, and is maybe one block wide. It seems small by any standard. We are told that Anchorage has had a population explosion that has brought the population to a bursting-at-the-seams number of five hundred thousand. Even so, we saw a moose walking right through the middle of the city in broad daylight with traffic whizzing by; it nonchalantly cut through front yards. It was the ultimate Northern Exposure experience. We are told that buildings are low because this is major earthquake territory. Our housing is a beautiful second floor apartment, affectionately known as the downtown penthouse. It has windows overlooking the park with a view of the ocean and the mountains. It is spectacular. As the days go by outside our rooms with a view, we see many dog walkers, joggers, Frisbee players (yes they play and run and walk in the snow) and ravens as huge as cats, their shiny blackness like ink blots on the snow. We have never seen so many beautiful shades of white. The next morning we get up around nine, and it is still dark in a pre-dawn dusky sort of way. It’s a little disconcerting, because it seems like it should be six in the morning, and we want to go back to sleep for a couple of more hours. But we check all the clocks in the house, and the activity outside of our windows of people going to work confirms that the time is correct. It is fully light by eleven, but the bright sun stays very low in the Southern sky with the intensity of a gorgeous sunset. By 3:30 in the afternoon, it’s getting a dusky twilight look. It seems the perfect atmosphere for tango people; after all we are the quintessential night people. The night of our first class comes. We arrive at a Junior high school. There are hundreds of pairs of boots lined up outside the gym doors where our class will take place. We don’t know what to expect. All of this is a gamble for both the promoter and for us. It’s a long way from Buenos Aires. There’s a Swing class in progress, and the place is packed. We wonder how many of these people have an interest in Argentine tango. At the end of the class, people start to leave. We’ve been told that the Swing dancers are purists, and don’t mix their dances. We’ve often heard this from Argentine tango dancers too, so it is understandable for us to think that this large Swing group will not necessarily become part of our class. The gym looks huge. We are pegged as the teachers, and a few people say hello and make polite small talk. Everyone is very direct and disarming. You have to be a special soul to live in Alaska. 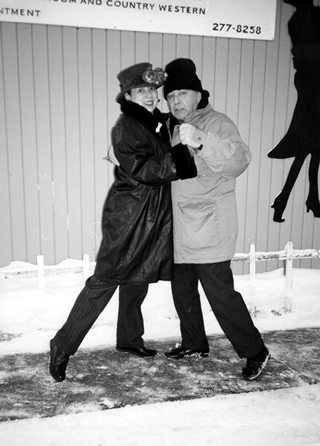 We realize that we’re going to be part of the very first authentic tango dancing experience in Alaska. We take a deep breath, we exchange an encouraging wink and we can’t wait to invite everybody to embrace and walk. From zero on up, the tundra milongueros would never be prisoners of the Eight Count Basic or the sanitized American version of genderless tango. A tall order indeed, a unique challenge, and a rewarding opportunity to become an integral part on the creation of a new tango community thousands of miles from the birthplace of tango and surrounded by a thousand shades of white. We are signaled to start the class, and we are very pleased and a little unnerved to see the room packed with dancers! And yes these people are pure dancers. There are no agendas, no excuses, no mental masturbation. Instead there is openness, intelligence, free spirit and comfort with their bodies. We present a comprehensive amount of material at a very brisk pace, and they are with us one hundred percent. The music is playing and they are dancing. On this night this version of la ronda reminds us of another gymnasium on the other side of the world on a Saturday night in the Sunderland Club in Buenos Aires. We are overcome with the emotion that never ceases to surface when we see people dancing this hundred-something dance born in the mud out of a melting pot of a luscious variety of music and life experience of the immigrants of Buenos Aires. I whisper in Alberto’s ear Nochera soy, and say, look at them, so are they. Nochero/a: A night person. The title of a tango composed by Oscar Herrero and made a classic by Osvaldo Pugliese.